Commissioner of Police, Thane, took initiative in building Thane Police School. This situation was noticed by a visionary police commissioner who then thought of building a school which would not only be a great help to the police children’s but also for other civilians. It was no small accomplishment and one can applaud his patience & dedication for his quick action… “A school built in a period of just three months”. 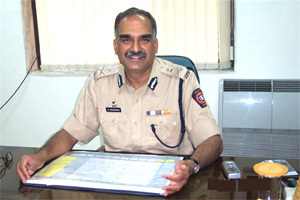 Mr. D.Shivanandan, the Commissioner of Police, Thane was instrumental in the success of this school. Wiithout his hard work and focused attention a flawless school couldn’t have been constructed. Mr. D.Shivanandan had almost a magical ability to turn his words into a beautiful school.